I love Spring time; changes are in the air, flowers magically bloom, all things brown turn green, birds chirping and the promise of good things to come. I always know Spring is here when our Bougainvillea and Roses start climbing our arbors adding vibrant pops of color in the yard. 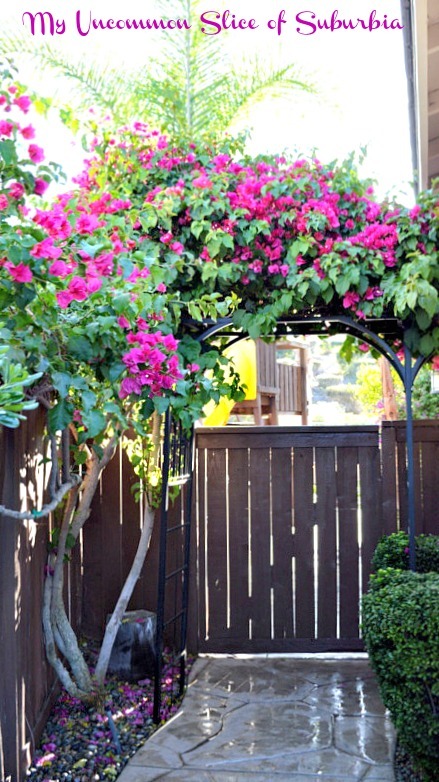 I have always had a love for arbors, they add so much beauty to the garden! The one with the roses my hubby made for me a few years back, it always puts a smile on my face when I see the roses climbing up the sides in full bloom. In the back yard I plant most of my flowers in pots so I can brighten up the patio. I love pots in all differen’t sizes and colors and I expecially love aged pots. 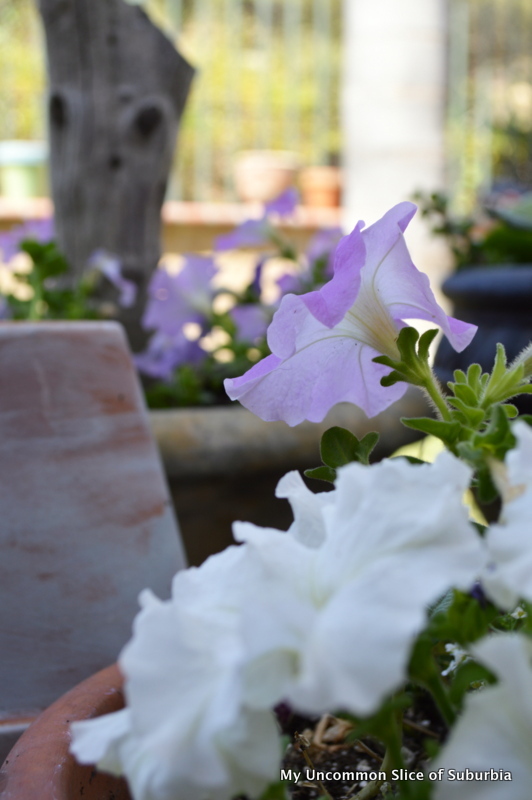 Aging a terra cotta pot is one of the most simple things to do and it adds so much charm. Grab whatever paint you have on hand, think creamy antique colors, a sponge and wax. The wax will protect against moisture and make the pots more durable. Mix the paint with a good amount of wax till smooth. Take a sponge and apply the paint mixture onto the terra-cotta pot leaving certain areas of the pot lightly exposed. I find my pots at the dollar store. You are left with a gorgeous pot that looks like it has been sitting around for years. 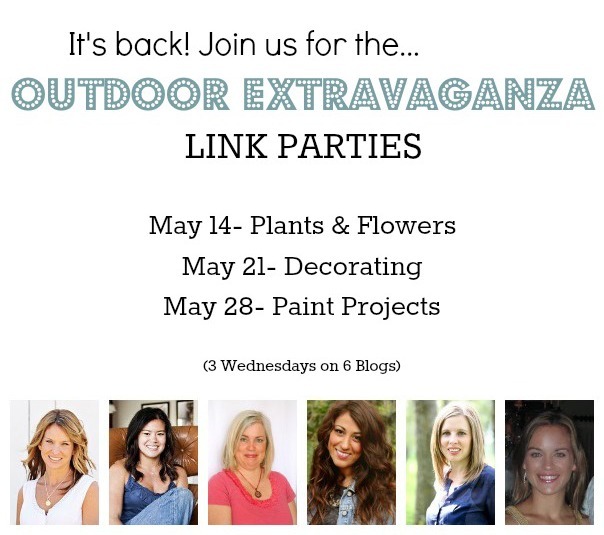 Come back tomorrow for the Outdoor Extravaganza Plants & Flowers link party. I can’t wait to see all your inspiring projects! 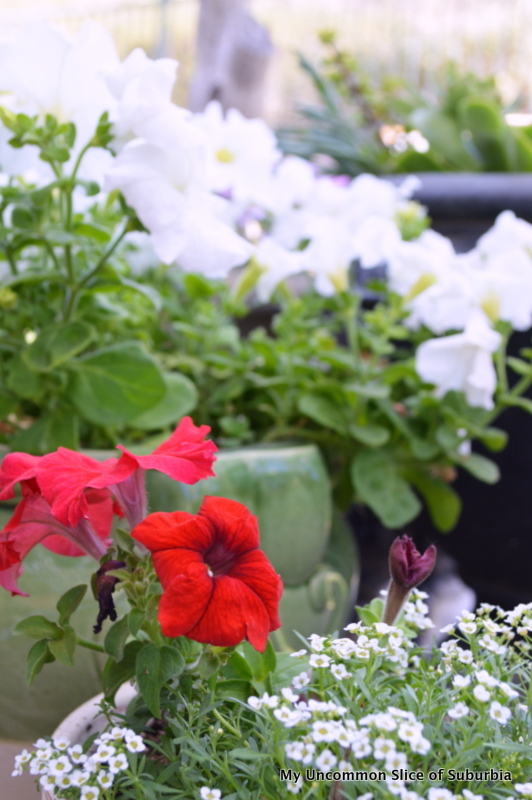 Love the look of aged pots…your flowers are gorgeous Kristin!! 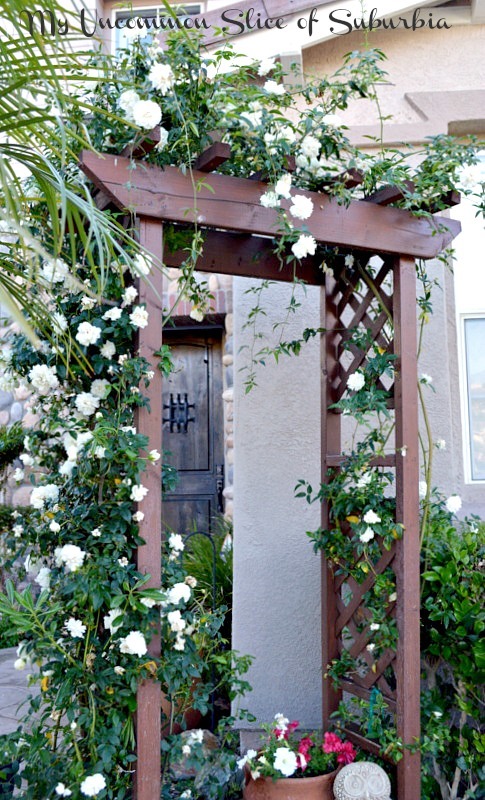 Your garden is gorgeous, especially your arbor. I adore those aged pots too! Love the arbors! And, thanks for the tip on aging pots. I need to purchase a few new ones this year. Great tip! I love terra-cotta pots, and they look great when they are weathered! Your yard is beautiful! I am soooooo jealous that you live in a place where bougainvillea are hardy. They’re so pretty! I love the arbors and all the climbing flowers! I can’t believe it is all in bloom, almost nothing in my neighborhood is blooming yet! My mother – in – law just gave me a Bougainvillea plant for Mother’s Day and I’m so excited to get mine planted. I’ve been debating Wisteria on our pergola for two years now and seeing how full your plants look makes me wish I just bit the bullet and planted something as soon as we built it! Love the terra cotta planters! Our neighbor has wisteria and it is so pretty! Both will become just brown branches during the winter but come Spring they are both so pretty. Looks beautiful Kristin! That arbor is amazing! Your garden looks lovely Kristin! 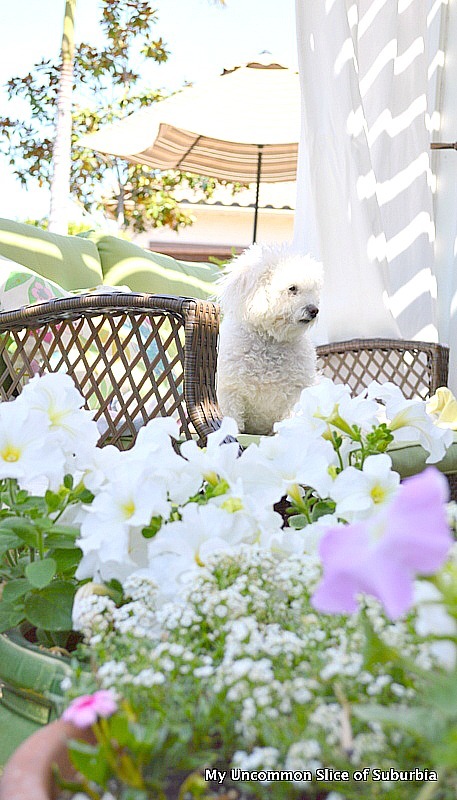 The blooms look so pretty on your arbours and all of your planters look beautiful. Thanks for the terra cotta planter tip too, Pinned! I have everything I need on hand…so I’m going to age my pots this weekend! Thanks for the tutorial and the inspiration.